Published in the South Kent Gazette, 25 March, 1981. It was not intended, in the first instance, to build the workhouse within the borough of Dover, because the populous parish of St Mary was not included in the River Union, and the country Guardians, for quite a year, kept up a stout opposition to its inclusion, it being their opinion that it would east a large burden on the rural ratepayers. The first resolution was to build a new house on the land adjoining the existing one at River. Consideration of finance, however, eventually turned the scale. It was found that the River house and land, which would be of little use for Poor Law purposes, could be sold for more than £2,000, and it was resolved to sell at River, and start anew in Buckland Bottom. The first offer of land there was made by Mr John Finnis, who tendered 2½ acres at the price of £300. This was accepted, but subsequently it was found that the site bad no approach road, and Mr G. H. Loud, who owned the right of way, offered the present site at £80 an acre, and it was eventually purchased, costing £404. It was stipulated that the new house should be built on the same plan as Bridge Workhouse, then in the course of erection; and Mr Lancefield, of Canterbury, having prepared the plans and specifications, Mr John Finnis undertook to do the carpenters’ work by specification, and Messrs Collyer and Winder the bricklaying by measure, their combined tender amounting to £4,391. Various alterations were made in the plans during the progress of the works, and the cost, when the work was completed, was £5,970 for the building and £404 for the land, making a total of £6,374. On the 29th of September, 1836, the inmates of St Mary’s Poorhouse were brought to Buckland, and that at once necessitated several additions to the House, including the hospital, which was also built by Mr Finnis and Messrs Collyer and Winder, at an additional cost of £2,000. The original house was the quadrangle, including the entrance gate and two wings in front, and the low buildings and dormitories on the other sides, with walls across the yard to divide the sexes, and the old from the young. A part of the quadrangle was used as an infirmary, but when St Mary’s poor were added, the oldest block of the hospital range, on the terrace, was built. There was a further enlargement of the house in 1849, another in 1871, another in 1897, another in 1903, as well as alterations and additions at other times. The greatest addition at any one time was the enlargement of the hospital and other improvements, for which a loan of £5,800 was raised in 1897, the plans on that occasion being drawn by Messrs Creswell and Newman, who also provided the plans for an addition on the western side, to give accommodation chiefly for the children. Earlier additions were the schools and children’s dormitories at the north-west angle, the chapel provided by subscriptions, and the laundry, a very important part of the establishment. Under the 1930 Local Government Act the care of the poor was transferred to the Kent County Council and the Board of Guardians was abolished. The county council’s public assistance committee gradually acquired more power to help the needy and made the Dover Workhouse redundant. But during the second world war the buildings, which had been modernised to some extent, found a new role as a casualty hospital dealing with hundreds of patients of many nationalities, including German airmen shot shot down over Kent, or sailors picked up in the Channel, many of whom could not speak a word of English. Early in 1943 the workhouse buildings became the County Hospital and as war casualties brought to Dover diminished civilian patients were admitted. The establishment did not acquire the name Buckland Hospital until 1948 when the administration of the hospital passed from the public health department of the county council to the Regional Hospital Board under the control of the South East Hospital Management Committee. Many changes and improvements have taken place since then but many of the old buildings are still in use and a completely new hospital on a different site has long been planned but has yet to find a place in a definite building programme. The hospital chapel was built about 1897 the priests of Buckland Church long performing the duty of hospital chaplains. 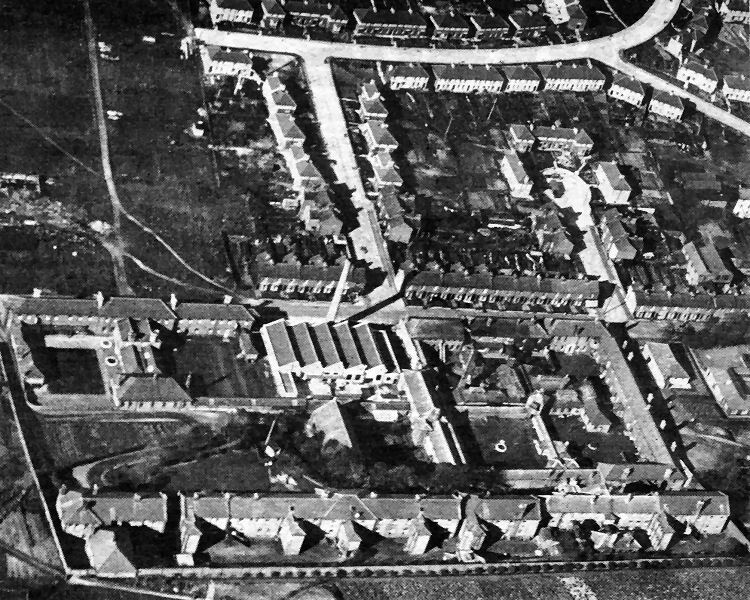 An aerial view of the Dover Workhouse complex of buildings in Coombe Valley Road which became first a casualty hospital during the Second World War and was then taken over as a County Hospital by Kent County Council, in 1943. Five years later it acquired the name of Buckland Hospital. Opposite the middle of the workhouse buildings on the other side of Coombe Valley Road is Lambton Road, leading to Beaufoy Road — named after Mr C. E. Beaufoy, who was Dover’s mayor in 1919 — and Primrose Road on the right which was named after Major-General Primrose who made his name in the Afghan War. Opposite the lower end of the buildings is Macdonald Road named sifter a British general who earned fame in the Boer War. The cul-de-sac was laid out just after the turn of the century. 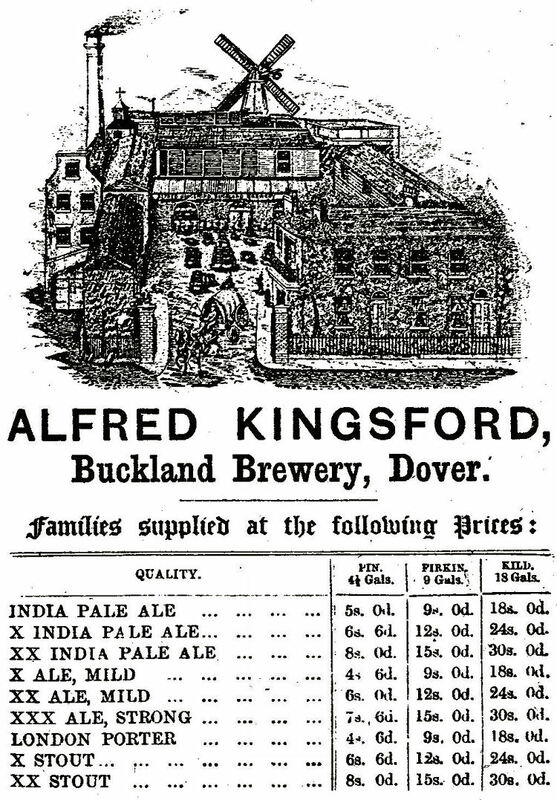 Above is showing a Kingsford Brewery advertisement of over 90 years ago.